SW : HOK HOK (Hot hot, it means)!! Me : No, it's not hot, it's warm, can be eaten. 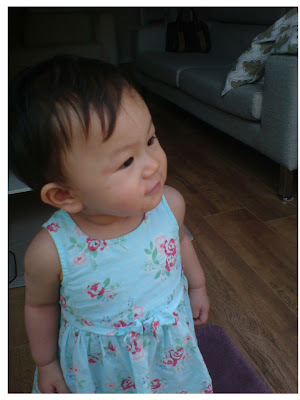 SW : *shakes head* *pushes my hands away* HOK HOK *shows me her tongue* HOK HOK! 3. Weekday romping at the mall - somewhere in Canary Wharf. I saw Zaza, a newly opened gelato shop. Asks for a single scoop Hazelnut in cup (comes with a baby-cone). SW : *takes a tiny taste of it and turned her head away* HOK HOK!!! Me : -_-" Not HOT, COLD COLD! Me : You want somemore? SW : *Nods* *Opens her mouth - takes a little* HOK HOK! Me : What does the Tiger do? SW : *makes roarring sound* GRRRR! Me : What does the Monkey do? Me : Monkey do what? Here is an UNEDITED video taped using my handphone (very low resolution) but you can hear her saying WA-BEET (Rabbit) with some hand-gestures, and also doing some other animal sounds. I heard a loud knock - she has fallen down and knocked herself. Shean Wenn cries.. and composes herself before coming to find me. I hurried out from the kitchen. 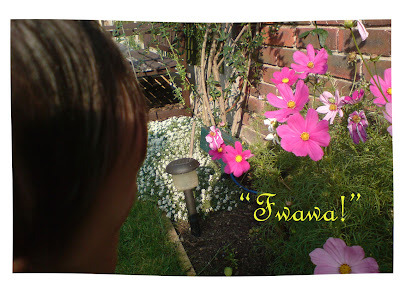 She brings me to the scene of accident and pats her hand on the floor, showing me where she has fallen down. I said "Oh no, is this where you fell?" She nods, and then uses her hand to "hit" the floor - something I taught her in order to distract her from the pain. She has been doing this quite alot - whenever she falls down, or hit herself while playing. And yes, she still falls down and hits herself quite often, unfortunately! SW bring her favourite book to me (ok, she has alot of fav books!) - this is the one daddy bought for her form Dubai, with buttons at the side that when you press it, it will read out an object. SW flips to one page, points to the Car. Me : Yes, you are right. SW points to boat. Presses the button and it reads BOAT. While researching for our upcoming trip to the US (NYC & Miami), Meng came to me with two $1 bills; these are the leftovers from his previous trips to the US and he's asking me to put it in my wallet lest he forgets about them. Hmm, is this some kinda joke? I decided to check it out nonetheless. I keyed in the serial number and year and found out that we are the 2nd entry of this note. 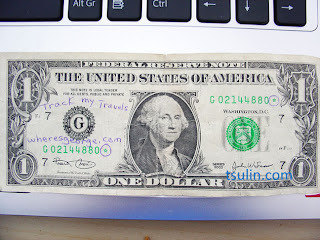 Not very interesting but I thought the idea of tracking dollar bills are pretty cool - kinda like how some people photograph their garden gnomes (or ipods, or whatever) around the globe and post it up on a site dedicated for it! 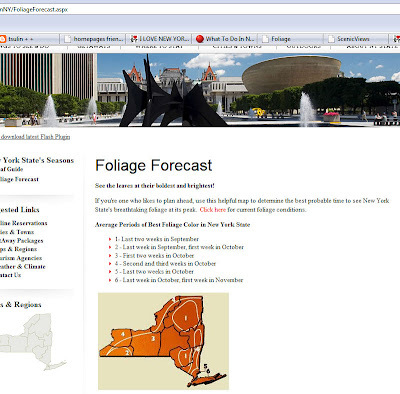 I also found pretty interesting stuff to do in NYC, for example for nature-enthusiats, you can plan your travels to NY state to look at the Autumn (or "FALL" as the Americans call it :P) leaves, there is a website on "Foliage Forecast". 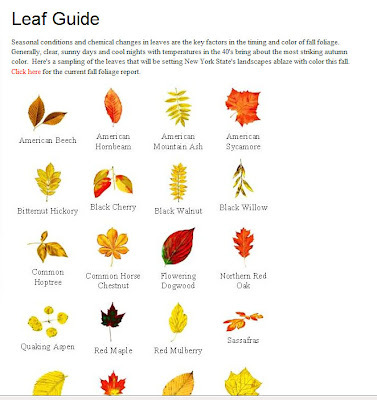 They have a useful "Leaf Guide" to show you the different colours of the leaves - "clear, sunny days and cool nights with temperatures around the 40's bring out the most striking autum color" (It's colour, tssk!). I am so excited! Autumn is one of the most romantic seasons (IMHO), and I'm sure Shean Wenn will love jumping and crushing the leaves as she walks along the pavements littered with them. 1. Have a "good hair day", everyday. Jazz up your looks, put on something interesting - life doesn't have to be all dull & boring. 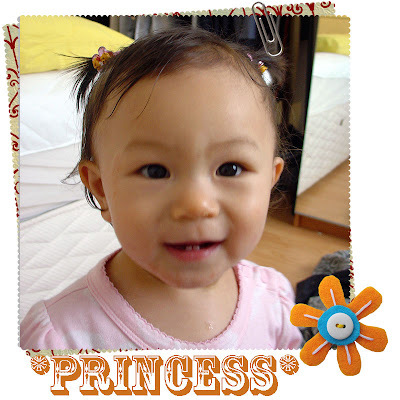 Shean Wenn loved having her hair tied into ponytails (eventhough she doesn't leave it on for long). 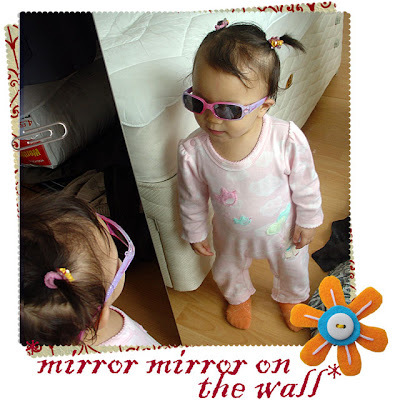 She puts on the sunglasses herself and checks herself out in the mirror. 2. Have your good friend/BFF (Best Friend Forever) around you - you will find your day to be much more enhanced when you have someone who's company you enjoy most. Share a story, talk, or just BE there for each other. 3. 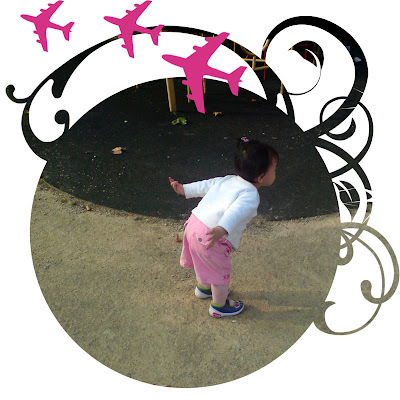 Aim for the sky - "be an aeroplane!" Photo credit : Photos with kaka taken by kaka's mom. 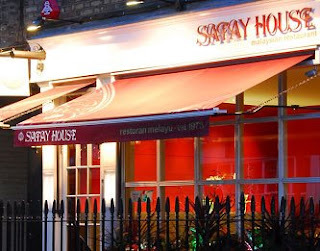 SW eyeing the BBQ pit - "When can I get my BBQ stingray with belacan sauce???!" The couple - actually the husband - did all the cooking. He's got belacan sauce for dipping, a whole assortment of BBQ stuff - stingray, salmon, the usual chicken wings and etc, all very delicious! The wife did a mean Pimms-mix (ice lemon tea?). SW - "Too warm, let's go into the house...." See how she makes this like her own home, she even wore her shoes running around inside. 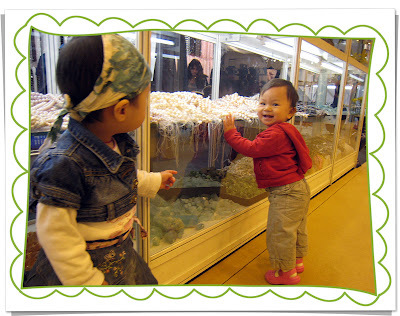 There was one other toddler amongst the group of friends, Joshua who is almost 2 years old. At first both of them didn't acknowledge each other but after warming up to each other, both of them were chasing each other aorund the house. 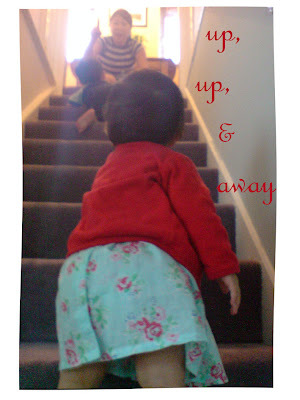 At one point, their favourite activity was climbing up (and down) the stairs. Of course, little Joshua is a confident and expert climber (and he can go down the stairs), but they both enjoyed the race, anyway. Later, after she was tired of running around the house, or of climbing the stairs, she decided to go out to the garden again. 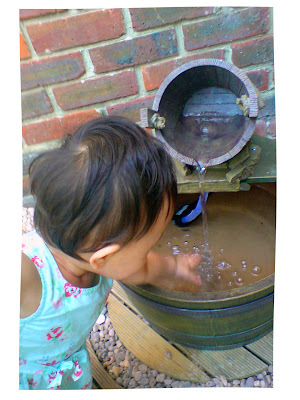 She loved the water feature and dipped her hands into it despite me telling her not to. Can't take NO for an answer now, this lady! 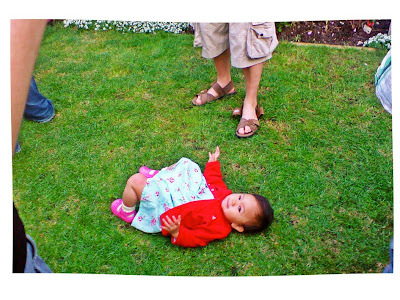 Rolling around the grass! How lady-like! 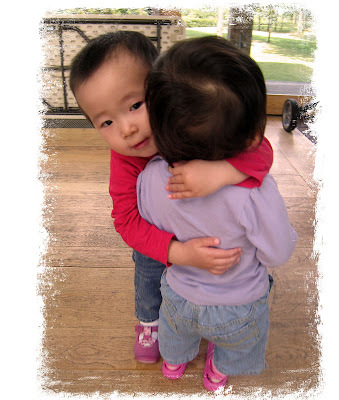 I have also came to know an asian family (from Hong Kong) from around the neighbourhood. They have a little girl, Karmen who is more than 1 month older than SW. Michelle, Karmen's mom had tickets to the International Jewellery London and asked me to go along. 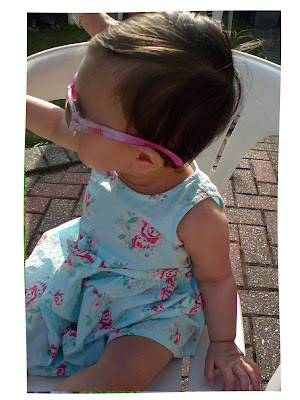 We made the journey to Earl's Court that day and both the little girls enjoyed it immensely! Since both of them have been seeing each other so often, Shean Wenn has become very sociable around Karmen. 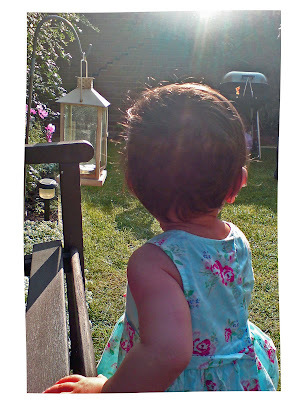 Karmen, on the other hand, has always been a sociable and friendly baby. 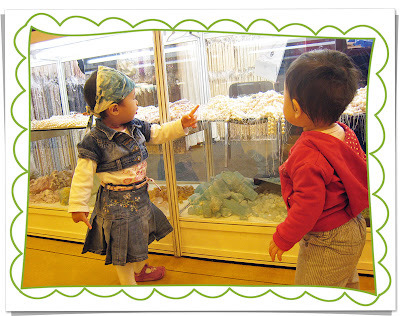 See the two little future diamond traders in action!